The star's album producer and long-time studio collaborator Tony Visconti has previously rubbished reports that the singer could embark on a series of gigs. But model Iman told Grazia magazine: "We have a 12-year-old (daughter, Alexandria) in school so we are stuck, we can't travel." "Our schedule is around her, so I don't know. "We'll have to go visit him, but we won't be on tour with him because she's in school." The Life On Mars singer surprised fans by suddenly announcing his comeback in January after years of withdrawing from the spotlight, with the release of a single Where Are We Now? on his 66th birthday. 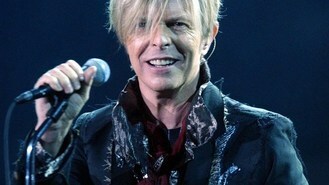 He later released a video co-starring Tilda Swinton for The Stars (Are Out Tonight). Album producer Tony recently said: "He made that very clear to the label that he wasn't going to tour or do any kind of ridiculously long album promotion. I spoke to him two days ago and he said, 'I'm really adamant I'm not gonna do a tour.' And he said, 'If I might, I might do one show.' But who knows when."